Purveyors of expensive, explodey blockbuster films Lionsgate (who’ve just added their films to Steam) have taken another bold step towards making a Borderlands movie a reality by placing scriptwriting responsibilities at the feet of Section 6 and GI Joe 3 writer Aaron Berg. Craving more aim-down-sights action? Then the best FPS games is for you. Berg joins father-son production duo Avi and Ari Arad as the one of very few people currently attached to the project after it was announced back in August 2015. The producers are most notable for their part in bringing some of Marvel’s biggest names to cinemas, including X-Men, Spider-Man, Iron Man and … Ghost Rider – so adjust your expectations accordingly. According to sources from The Hollywood Reporter the upcoming film is hoping to achieve a “Mad Max in space” tone, and will most likely be relesed with an R-rating, something you’d probably guessed from a cursory glance at the source material. We’re still unaware of why this particular game-to-movie adaptation is happening, though the more than 26 million copies Gearbox’s shooter franchise has shipped since the first game launched in 2009 would suggest there’s a significant monetary incentive behind the venture. There’s no release date or window set for the movie, and with the director and cast yet to be named we’d guess we’re still a couple of years away from seeing Pandora at the local multiplex. 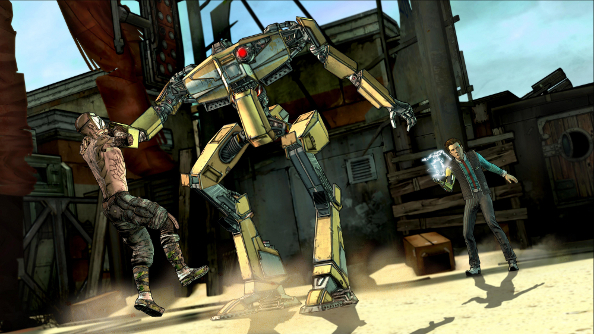 Think a Borderlands movie could finally break the mould of shoddy videogame-to-film transitions? Let us know in the comments below.